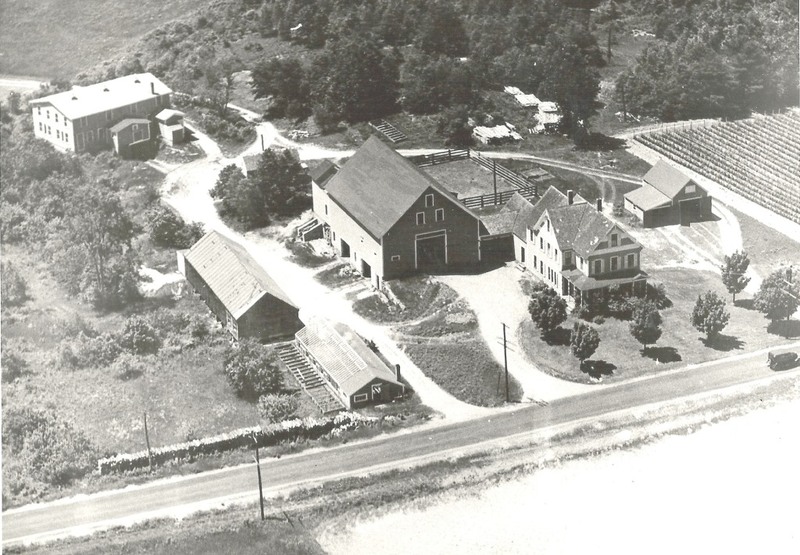 This week we look at more of the changes along Lowell Road with this 1939 aerial view. The farm buildings in the center of the photo are those of the Luther Pollard Farm. Owned by members of the Pollard/Parker family of Lowell, MA and Hudson; Robert Hardy was the farm manager. Robert and Bertha Hardy along with their large family lived in this farmhouse and worked the farm for the owners. Robert raised turkeys, chickens, cows for milk, as well as a large garden and fruit trees. Besides managing the farm resources, he was able to produce ample food for his family. John Hardy, Robert’s son, purchased the farm in 1946. Behind the farmhouse, but not visible because of the trees, was a large home with spacious porches. This was the Pollard/Parker family’s summer home. Along side and to right of the farmhouse is Lowell Road. Barely visible because it is hidden under a row of trees. Looking north, towards the top of the photo, pieces of the road are visible. On the opposite side of Lowell Road, to our right, is the farmhouse and farm of Raymond Pollard. Ray, his father and grandfather before him owned and operated this particular farm. By sharp contrast, today both farm houses are gone. 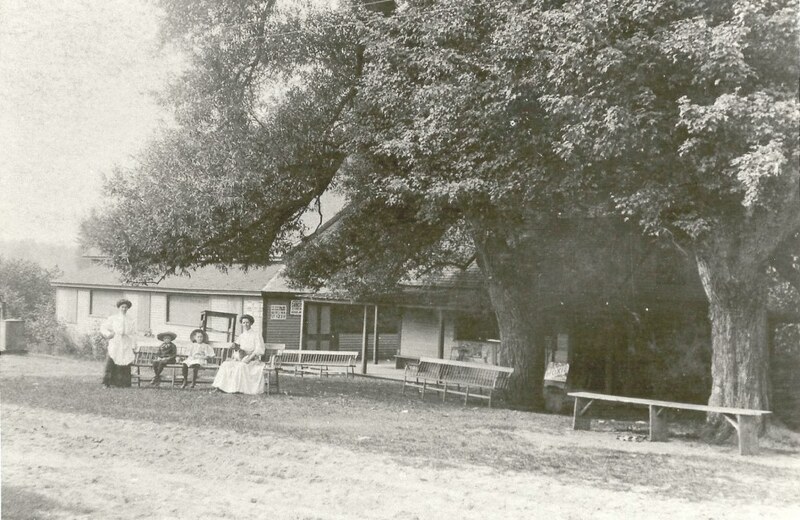 Where the Pollard/Parker farmhouse stood we now have the recently built Inn at Fairview, a part of the Fairview Nursing facility. Likewise the home of Ray Pollard has been removed; now the location of the north end of the parking lot of Market Basket at the corner of Lowell and Wason Roads. The garden seen in the forefront of the photo is now the location of Haffners. Lowell Road is no longer a narrow two lane roadway; now a four plus lane highway with plenty of traffic and traffic lights!! The open fields for market produce have given way to houses and industrial parks. Enjoy this step back in time! We will explore more of these early landmarks in the weeks ahead. Photo from the Historical Society collection. The society can be reached for comment by calling 880-2020 or sending email to HudsonHistorical@live.com. By 1930 Alphonse and Eleanor Steckevicz with their family of 3 boys (Edwin, Alfred, and Chester) and 1 girl (Emma) had moved into their house on Riverside Avenue in Hudson. Alphonse established the Clover Farms Store, a neighborhood grocery, attached to the family home and facing Lowell Road. This C 1935 photo shows the Clover Farm Store and the Shell gasoline pumps taken from Lowell Road. Members of the Steckevicz family who were working at the store are in front. The 1935 Pontiac sedan on the left most likely belongs to one of the customers; if it belonged to the family it would not be parked so as to block customer access to the gas pump! Alphonse owned and operated this store for about 25 years at which time ho sold to his son, Edwin. Edwin was a 1935 graduate of Nashua High School, a WWII veteran serving in the Army Air Corps. The Clover Farm Store remained under his management until he sold to Ray Lefebvre about 1961. Edwin also served his town as selectman for many years. His store on Lowell Road became a community gathering place. He knew his customers by name. Edwin was often known to open his store at all hours to help a customer in need. Edwin married Josephine Wolen with whom he had 60 plus years of marriage before passing in 2007. This store continued under the ownership of Ray Lefebvre for many years. This building at the corner of Lowell and Riverside remains to this day; it is currently not used. Most recently it was Cheemas Supermarket. Photo from the Hudson Historical Society collection. By 1935 Nicolae and Cornelia Simo with their young family of Victoria and John moved from Nashua to this house at 57 Lowell Road in Hudson. The trolly and later bus services made it possible for Nicolae to comute to his job as a shoe worker at J. F. McElwain Shoe Company in Nashua. Cornelia held a position at Fort Devens in Mass. Daughter Victoria attended Hudson schools and graduated from Nashua High. She was active in 4-H, Scouts, and the youth activities of the Hudson Community Church. After High School she attended the Rhode Island School of Design in Providence. She later married and lived in Conn. John was able to complete his high school in Hudson; being a member of the first class to graduate from Alvirne in 1951. He was also active in 4-H and the youth activities of the Community Church. This weeks photo shows the Simo home about 1947; the woman seated on the front steps has been identified as Cornelia. John was one of many Hudson teenagers who worked at Bensons Animal Farm during the summer months. Upon graduation from Alvirne, John and a high school friend of his traveled to Seatle, Wash. for summer work at The Jolly Green Giant Factory. His friend returned to Hudson to attend college. John remained on the west coast, traveling and working in various states for several years. When he did return return to New Hampshire he married Glenda Pratt of Milford and made his home in his current town of Milford. Cornelia passed in 1965; Nicolae continued to live in this house until about 1984 when he moved to Milford with his son John. Nicolae passed in 1989. John remembers his mother as an intelligent woman who was fluent in many languages. His dad had musical abilities with the violin; being able to repeat a tune after hearing it a single time. By 1984 Lowell Road was becoming a busy commercial road; no longer the rural and residential road of the previous decades. As with many homes along Lowell Road this one at number 57 would transition into commercial use. Many of our readers may recall Dunkin Dogs, a self service dog shampoo parlor and grooming establishment. Today this site is the location of Stellar Motors, a used automobile mart. Thanks to John Simo of Milford for the memories; photo from the Hudson Historical Society collection. This week we go back to about 1935 and look west on Central Street across from what is now 74 Central (near Hammond Park). In fact, the first mailbox on the right side of Central Street is for that home; the home of Gerri and Leon Hammond for many years. In the forefront Central Street is a dirt roadway and remains dirt until just before the intersection with Lowell. To help locate this intersection follow the utility poles which veer to the left behind the row of maple trees. When we compare the C 1935 photo with the current photo, we realize the Lowell and Central intersection was more of a sharp angle; not the 90 degree one it is today. On the right side of Central is what is now 72 Central, for many years the home of Hazel (Jewell) Austin. On the left and at the beginning of Lowell Road is what is now 1 Lowell Road. In the center of the picture, barely visible is 59 Central, the former home of Maude Priest. The morning sunlight casts a square shadow across the left side of the picture. This is the image of the old tenement called ‘The Beehive’ located on Central and long since removed. The early photo,from the Historical Society Collection, has been difficult to date. If any of our readers can provide input please contact the HLN or the Historical Society by email at HudsonHistorical@live.com or by phone at 880-2020.